Newly appointed female directors are more likely to bring new and unique skills to the board. András Tilcsik, associate professor of strategic management, received a Tier 2 Canada Research Chair. His work with GATE focuses on de-biasing job evaluations. Exploring both sides of the gender diversity quota debate, highlighting the latest research on pros and cons, and what to do about it. 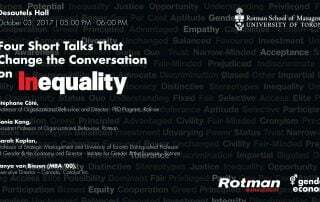 As part of our Rotman Short Talks series, hear from Professor Sarah Kaplan about why progress towards gender equality is slow. In it, she focuses on the risks of backlash and the discomfort associated with diversity. Many businesses write mission statements that affirm their support for diversity and put their staff through “implicit bias training." Both steps are well-intentioned but can be counter-productive if not backed by deeper changes, warns Sarah Kaplan in the Financial Times. See this segment with Sarah Kaplan on TVO's The Agenda with Steve Paikin which aired on International Women's Day 2017. It covers some of the key issues to consider when thinking about gender and the economy.